It is an open secret that several of even the mainstream “high street” charities and NGOs long ago morphed into political associations. One area where this is most obvious is environmentalism. According to War on Want, the only way to fight climate change (and presumably everything else they don’t like) is to smash capitalism. Activists who’ve never had to worry about starvation, malaria and simple survival have no right to impose their fears, prejudices and ideologies on the world’s poor. Stewart Brand, one-time Green guru, describes in his book Whole Earth Discipline: An Ecopragmatist Manifesto the infiltration of his field in the 90s by far-left ideologues, refugees from the lost Cold War who saw environmentalism as a new way of attacking the west and its economic system. Outside the Green ideological industry, we also have no trouble finding NGOs with blatant political agendas. Human Right Watch’s anti-Israeli stance is a glaring case. The main story on its Middle East page is very generally a criticism of Israel – quite absurd in a region where many countries and organisations, including and especially Israel’s enemies, are guilty of particularly egregious human rights abuse. The aid charities are hybrids with incompatible aims. On the one hand, they provide relief regardless of the political consequences – like the Red Cross – and, on the other, they lobby for political change – like Human Rights Watch. … if Oxfam were to speak out against the obscenity of Robert Mugabe’s Zimbabwe being elected to head the UN Commission on Sustainable Development, there’s a fair chance Mugabe would stop Oxfam workers from relieving the suffering inflicted by his economically unsustainable regime. Its hybrid status means Oxfam has to direct disapproval at governments that won’t respond to criticism by closing down Oxfam operations, but, rather, will invite Stocking in for a chat and a cup of tea. The aid charities are therefore treacherous guides to global politics. They are dependent on dictators and must overlook their crimes. They are respected by democrats and can therefore safely blame the democracies for the crimes of others. This is clearly the case applying to Israel and its enemies. The latter governed by warlords and dictators to whom the charities must fawn, the former a democracy which is frequently berated for the crimes of others. Most iconically, the plight of the Gazans cannot be laid at the feet of Hamas without consequences for aid workers on the ground and so it is thrust upon Israel, whose only intent is to defend its citizens from Hamas and jihadist attacks. It may well be the case that this existential bind is inescapable. But the agencies should at least be honest with themselves, and not all are. Some agencies, indeed are dabbling in politics of which they have little understanding. As Oxfam launches a campaigning drive to lift the blockade on Gaza, Katy Wright imagines how her own life would be affected by living under the conditions in Gaza. I’m sorry. I beg your pardon? Oxfam campaigning to end what it calls “the blockade”? When did it become the remit of Oxfam to enter the arena of international diplomacy? The politicisation is already clear in the language. In this most bizarre of pieces, the extraordinarily self-referential author compares the refitting of her bathroom to the “conditions in Gaza”. Yes, dear Katy, I’m sure the tribulations of handling English plumbers is the closest thing to dealing with the Islamist Hamas police. This just gets crazier. The freedom of movement of ALL Gaza residents? Including the jihadists and the poor men, women and children brainwashed into becoming suicide bombers? There are few borders in the world where freedom of movement needs policing as much as this one. In any case this list turns out to be a fabrication, based on little more than interviews with Gazan shopkeepers of the type “what are you finding in short supply this week?”. It’s a shocking injustice that the people of Gaza are denied such items as coriander, crisps, A4 paper (!?) or toys. The Gaza blockade is a humanitarian crisis. No, Katy. Darfur, Haiti, the Pakistan floods are humanitarian crises, and your use of the term cheapens their victims. The crisis in Gaza is political: the place is governed by a reactionary fundamentalist war-party which craves not well-being for its people but the deaths of its neighbours. What makes such minds tick? How can she not know what would happen if there was no control over imports into and “exports” out of the terrorist state of Gaza? Would she feel guilty or pleased when the first Iranian-made rocket hit a Sderot school or the first suicide bomber exploded in an Ashdod kindergarten? Meanwhile yes, indeed, there are shocking injustices being perpetrated in Gaza. There are too many poor people whose livelihoods are being squandered in the futile belligerence against Israel. There are however also a growing number of fat Hamas cats growing ever fatter on monopoly licenses and illegal trade, including the brutal trafficking of sub-Saharan emigrants. While it may be the case that Oxfam is trapped in the aid agency existential bind and therefore cannot criticise directly those actually responsible for the plight of the Gazans, namely Hamas, at least the people it hosts on its site might have a minimal knowledge of the facts on the ground and refrain from spreading Hamas’s propaganda for it. But I’m left with a lingering doubt. If I was cursed with a more suspicious turn of mind, I might wonder whether hosting such pieces on the world’s favourite conflict which attacks the left’s favourite hate-figure, Israel, is thought to be good for donations. The campaign to greatly restrict Israel’s defensive measures, with all the inevitable bloody consequences, seems entirely acceptable if it means money in the bank, keeping well-paid jobs, expanding the corporation. But no. Nobody could be so unscrupulous. Certainly not an aid agency. A little falsehood earns a lot more bread. War On Want is disgusting when it comes to Israel. John Hilary is particularly pompous and out of control. Brilliant article shame that so many charities jump on the blame Israel bandwagon. Certainly I would not give a penny either to Oxfam or War On Want, or any charity if I am aware it is hostile to Israel. A friend emailed me pictures of the opulent luxury that Mugabe lives in while majority of Zimbabweans live in dire poverty and many starve. As for Gaza I do question that people in supposed poverty have no shortage of weaponry, and energy to focus on the demise of thier enemy, just does not add up. Despite internet, widespread media, education the west seems to becoming far more gulible to lies and propaganda. What ever happened to rational thought, majority tend to swallow the propaganda at an alarming rate. While I can understand that NGOs and charitable non religious organisations are populated by people with a left leaning persuasion, the fact is that they have been taken over by the radical far left. As such they will wither as criticism becomes ever more vocal. And loud. But that is what happens to all radical left projects. From Soviet Russia to Pol Pot. And will happen to North Korea. The poster above was created by Oxfam Belgium in 2003. 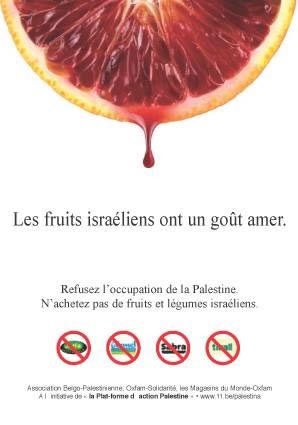 It was the first time in Europe that this type of antisemitic blood libel imagery was used against Israel. It has never stopped since. Oxfam Internation eventually issued an apology after the Simon Wiesenthal Center led a worldwide campaign against the poster. A more recent Belgian boycott campaign used dates splashed with blood. It has given me a clue as to why intellectual and moral cowards who hide behind religion, like the Rev Naim Ateek of the Sabeel Ecumenical (and that should be in quotes) Liberation Theology Centre in Israel, divest themselves of all pretensions towards intelligence and humanity and write about Israel and Jews as they do. These “Christians” whose religion teaches them to treat everyone as their brother, spend all their time revising Jewish history so as to try to undermine the Jewish link with Israel and in the (vain) hope that the PA and other Muslim authorities will treat them leniently. Of course they remain in danger because they are still dhimmis. Atik refers to Jesus as the first Palestinian, (although there was no Palestine in Jesus’ time) and is not above resorting to blood libel – that the Jews are “crucifying” present day Palestinians in the way they crucified Jesus. He’s trying very hard to make Christianity acceptable to Islamists. He cannot succeed.